With this central location (in one of the main business districts of the city), the space is just 3-5 minutes walk from underground train station and buses run through the area frequently. The space offers private offices for 1 or 2 people, work stations, meeting rooms for up to 12 people and seminar space which can hold up to 26 people. Other amenities include videoconferencing facilities, Wi-Fi, landline, printing and copying facilities and a fully equipped kitchen. Just 2 minutes walk from the space, there is a grand selection of hotels. This centre is set within a vibrant and easily accessible district of Athens, with a bountiful array of local conveniences and services close by. The region's transport links are excellent and the centre's high quality and professional office suites are available for immediate occupancy and at exceptional value. Owing to this centre's abundance of facilities, this is the ideal workspace solution for businesses that desire practicality as well as convenience. All the spaces are modern and luxurious, ready to welcome all kind of professionals like freelancers, small-medium companies and startups that need a unique work-environment. The meeting rooms are fully equipped for prosperous meetings with your partners or clients. Impress your clients in one of the many nearby restaurants or enjoy a luxury coffee at one of the local cafés. There are many hotels within walking distance so your colleagues and clients will never be short of options for their overnight stays. Modern, stylish office spaces with meeting and training rooms in the heart of Athens. Whether you have a start-up business or a growing corporation, this workspace solution provides convenient facilities to help your company run as efficiently as possible. 24 hour access, meeting rooms and training rooms. It is 10 minutes away from Athens city centre by car, and well within walking distance of vibrant bars, shops, restaurants and cafes. Located in the best are of the city, and one of the main business districts in Athens, this centre is close to underground stations and bus stops. 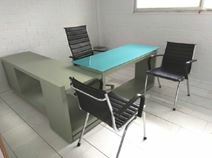 The centre offer seven luxury, fully equipped offices, with modern decoration and top quality furniture. Fully renovated to provide a comfortable and efficient business environment, with lots of tourist attractions to explore, including museums, within the surrounding area. Kindle your entrepreneurial spirit with the enthusiasm of others you connect with here. This centre is located in the heart of Athens, with excellent connectivity with nearby public transport stations including Metro Stations (line M1 and M3), tram line X95, T4 and T5 and bus lines 040 and 500. You can settle in knowing you can access your secure space 24-hours a day with full access to the Business Club. An impressive business centre in a prime location of Athens, providing furnished office-spaces available to let on flexible terms. Amenities include meeting rooms, parking, 24-hour access, reception and high-speed internet. Additionally, from this location you are extremely well connected with several subway and bus stations in close proximity. Amenities such as restaurants, shops and retailers can also be found nearby. Offering refurbished office rentals, this business space is modern and contemporary, offering comfortable but functional work spaces. The building always offers high speed and reliable internet throughout to keep you connected, and you can choose from a selection of private offices and coworking options. As well as commercial facilities, local attractions also include the Choco Factory Museum and the Natural History Museum. This brand new business centre is conveniently located in the Maroussi district, nerve centre of IT and telecoms companies and well served by public transport. The centre offers modern offices, lounge area, videoconferencing facilities and secure parking area. This outstanding turnkey solution also offers quality support services, such as administrative support, IT support, shared internet, and reception services. There are hotels within reach at which to accommodate international clients. This centre provides quality serviced offices in a five-storey building close to Athens's financial district. The building is home to a number of other businesses, and is easily accessible from Synggrou Avenue. This is the perfect workspace solution for forward-thinking companies that value practicality as well as efficiency. Unlimited high-speed internet is provided to keep you connected, in addition to voicemail services so you’ll never miss a thing. 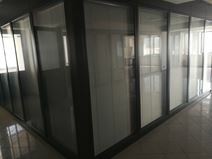 Offering modern and fully furnished offices in the heart of the the business district of Athens, this business space provides much more than just a professional and modern place to work. With 24 hour access you can come to work whenever you want and a range of facilities ensure you are comfortable. You can enjoy a beautiful roof terrace with great views of the skyline and you will have access to meeting rooms, lounge areas and kitchen facilities. Bike storage and showers are found on-site. With a thriving community in the business centre you can also benefit from the support of partners who work in various industries including law, accounting, HR and much more. Located in the innovative Maroussi district in Athens with a unique energy and environment ideal for growing your business. The district is known for being the financial heart of the city, and with a dedicated desk at this centre, you will be given access to a specific workstation everyday with individual locker storage and all the benefits of the business club meaning you can collaborate and connect with others while having your individual space to think and work. This centre is just 30 minutes away from Central Athens, and only 15 minutes from Athens International Airport by car. It offers fully furnished offices, accessible 24/7, so you can work as you please. This space features a garden where you can relax, as well as easy access to a number of local amenities; from restaurants to shops. Here, you will enjoy spectacular views of Saronikos Sea, as well as easy commutes to the south coast of Attica. This historic and superb building, situated within walking distance of the centre of Athens, enjoys a strategic location, thanks to excellent links to the northern suburbs of the city and to the airport. The building offers a stunning view of the city and is surrounded by a wide selection of fine restaurants and cafés. It consists of offices furnished to a high standard and provided with first class services. Centrally located in Athens, surrounded by shops, restaurants and various amenities, this workplace is provided with every type of facilities and services to run a business: translation, financial consultancy, conference facilities and promotional services. This is the perfect workspace solution for forward-thinking companies that want a well-equipped centre which will enhance the efficiency and productivity of their operations. An impressive centre providing both private and co-working office-space in Athens, with offices available to let on flexible terms at affordable prices. Tenants can make use of the high-speed internet, meeting rooms, lounge access and communal areas. The building is also accessible 24-hours a day, further increasing the flexibility in this prestigious environment. The local area is complete with many local amenities as well, including restaurants, retailers and a pharmacy. Strategically located in the main business district of Athens, Chalandri, this office space is well served by public transport and surrounded by restaurants, cafés, shops and banks. This modern centre hosts a selection of offices elegantly furnished and equipped with air conditioning and state-of-the-art telecommunication technology. It offers a wide range of facilities and services, including professional reception and secretarial staff and meeting rooms equipped with advanced technology.